Extractive metallurgy refers to the different processes used to extract valuable metals from mined ores. Metal ores are formed in the process of ore genesis, and they are extracted through mining. Extractive metallurgy is the practice of removing valuable metals from an ore and refining the extracted raw metals into a purer form. Hydrometallurgy uses aqueous solutions to extract metals from ores ( leaching ). Pyrometallurgy involves high temperature processes where chemical reactions take place. Electrometallurgy involves metallurgical processes that take place in some form of electrolytic cell. Extractive metallurgy: The practice of removing valuable metals from an ore and refining the extracted raw metals into a purer form. Leaching: A widely used extractive metallurgy technique which converts metals into soluble salts in aqueous media. ore: A type of rock that contains minerals with important elements including metals. An ore is a type of rock that contains minerals with important elements such as metals. Ores are extracted through mining; they are then refined to extract the valuable element(s). The grade or concentration of an ore mineral, or metal, as well as its form of occurrence, will directly affect the costs associated with mining it. The cost of extraction must be weighed against the metal value contained in the rock to determine which ores should be processed and which ores are of too low a grade to be worth mining. 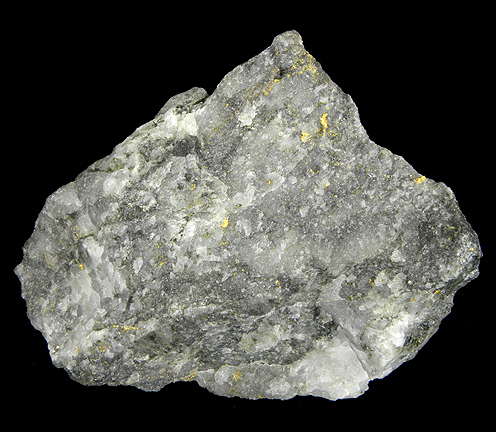 Gold Ore: High-grade gold ore from a quartz vein near Alma, Colorado. The appearance is typical of very good gold-quartz ore.
Metal ores are generally oxides, sulfides and silicates of “native” metals (such as native copper) that are not commonly concentrated in the Earth’s crust. Ore bodies are formed by a variety of geological processes. The process of ore formation is called ore genesis. First, the ore must be separated from unwanted rocks. Since most minerals are not pure metals, further separation methods are required. Most minerals are chemical compounds that contain metals and other elements. Extractive metallurgy is the practice of removing valuable metals from an ore and refining the extracted raw metals into a purer form. In order to convert a metal oxide or sulfide to a purer metal, the ore must be reduced physically, chemically, or electrolytically. Extractive metallurgists are interested in three primary streams: feed, concentrate (valuable metal oxide/sulfide), and tailings (waste). After mining, large pieces of the ore feed are broken through crushing and/or grinding. This step creates particles that are either mostly valuable or mostly waste. Concentrating the particles of value in a form supporting separation enables the desired metal to be removed from waste products. Ore bodies often contain more than one valuable metal. Tailings of a previous process may be used as a feed in another process to extract a secondary product from the original ore. Additionally, a concentrate may contain more than one valuable metal. That concentrate would be processed to separate the valuable metals into individual constituents. Hydrometallurgy is concerned with processes that use aqueous solutions to extract metals from ores. The most common hydrometallurgical process is leaching, which involves dissolution of the valuable metals into the aqueous solution. After the solution is separated from the ore solids, the solution is often subjected to various processes of purification and concentration before the valuable metal is recovered, either in its metallic state or as a chemical compound. The solution purification and concentration processes may include precipitation, distillation, adsorption, and solvent extraction. The final recovery step may involve precipitation, cementation, or an electrometallurgical process. Sometimes, hydrometallurgical processes may be carried out directly on the ore material without any pretreatment steps. More often, the ore must be pretreated by various mineral processing steps and sometimes by pyrometallurgical processes. Pyrometallurgy involves high temperature processes where chemical reactions take place among gases, solids, and molten materials. Solids containing valuable metals are either reacted to form intermediate compounds for further processing, or they are converted into their elemental or metallic state. Pyrometallurgical processes that involve gases and solids are typified by roasting operations. Processes that produce molten products are collectively referred to as smelting operations. The energy required to sustain the high temperature pyrometallurgical processes may come entirely from the exothermic nature of the chemical reactions taking place, usually oxidation reactions. Often, however, energy must be added to the process by combustion of fuel or, in the case of some smelting processes, by the direct application of electrical energy. Electrometallurgy involves metallurgical processes that take place in some form of electrolytic cell. The most common types of electrometallurgical processes are electrowinning and electro-refining. Electrowinning is an electrolysis process used to recover metals in aqueous solution, usually as the result of an ore having undergone one or more hydrometallurgical processes. The metal of interest is plated onto a cathode, while an anode is composed of an inert electrical conductor. Electro-refining is used to dissolve an impure metallic anode (typically from a smelting process) and produce a high purity cathode. Fused salt electrolysis is another electrometallurgical process whereby the valuable metal is dissolved into a molten salt, which acts as the electrolyte, and the valuable metal collects on the cathode of the cell. The scope of electrometallurgy has significant overlap with the areas of hydrometallurgy and (in the case of fused salt electrolysis) pyrometallurgy. Additionally, electrochemical phenomena play a considerable role in many mineral processing and hydrometallurgical processes. In refining, impure metal is purified; in steelmaking, impurities are removed from raw iron, and alloying elements are added. Recall that steel is made from iron ore. Steelmaking is the second step in producing steel from iron ore, where impurities are removed from the raw iron, and alloying elements are added to produce the exact steel required. Modern steelmaking processes are broken into two categories: primary and secondary steelmaking. Primary steelmaking uses mostly new iron as the feedstock, usually from a blast furnace. Secondary steelmaking is performed in an electric arc furnace and uses scrap steel as the primary raw material. Refining consists of purifying an impure metal. Wrought iron and refined iron are products of pig-iron refining. Refining: Refining (as in non-metallurgical uses) consists of purifying an impure material, in this case a metal. Steelmaking is the second step in producing steel from iron ore. In this stage, impurities such as sulfur, phosphorus, and excess carbon are removed from the raw iron, and alloying elements such as manganese, nickel, chromium, and vanadium are added to produce the exact steel required. Modern steelmaking processes are broken into two categories: primary and secondary steelmaking. Primary steelmaking uses mostly new iron as the feedstock, usually from a blast furnace. Secondary steelmaking uses scrap steel as the primary raw material. Gases created during the production of steel can be used as a power source. Basic oxygen steelmaking is a method of primary steelmaking in which carbon-rich molten pig iron (the iron created in the blast furnace) is made into steel. Blowing oxygen through molten pig iron lowers the carbon content of the alloy and changes it into low-carbon steel. The process is referred to as “basic” because of the pH of the refractories and the calcium oxide and magnesium oxide, which line the vessel to protect against the high temperature of molten metal. Secondary steelmaking is most commonly performed in an electric arc furnace. The furnace consists of a refractory-lined vessel, which is often water-cooled and covered with a retractable roof. It is through this vessel that one or more graphite electrodes enter the furnace. Once the furnace is charged with scrap metal, meltdown commences. The electrodes are lowered onto the scrap, an arc is struck, and the electrodes are set to bore into the layer of shred at the top of the furnace. Once the electrodes have reached the heavy melt at the base of the furnace and the arcs are shielded by the scrap, the voltage is increased and the electrodes raised slightly, increasing the power to the melt. Oxygen is blown into the scrap, combusting or cutting the steel, which accelerates scrap meltdown. Electric Arc Furnace: An electric arc furnace (the large cylinder) is tapped. The formation of slag, which floats on the surface of the molten steel, is an important part of steelmaking. Slag usually consists of metal oxides and acts as a destination for oxidized impurities. It functions as a thermal blanket, stopping excessive heat loss, and helping to reduce erosion of the refractory lining. When the scrap has completely melted down and a flat bath is reached, another bucket of scrap can be charged into the furnace and melted down. Once the temperature and chemistry are correct, the steel is tapped out into a preheated ladle by tilting the furnace. 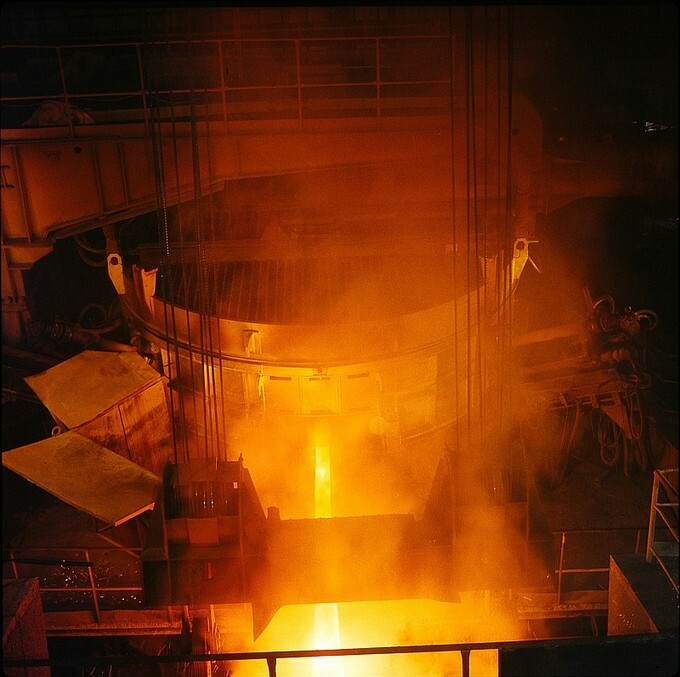 For plain-carbon steel furnaces, as soon as slag is detected during tapping, the furnace is rapidly tilted back towards the deslagging side, minimizing slag carryover into the ladle. The HIsarna steelmaking process is a process of primary steelmaking in which iron ore is processed almost directly into steel. The process is based on a new type of blast furnace called a Cyclone Converter Furnace, which makes it possible to skip the process of manufacturing pig iron pellets, a necessary step in the basic oxygen steelmaking process. Because it skips this step, the HIsarna process is more energy-efficient and has a lower carbon footprint than traditional steelmaking processes. Refining consists of purifying an impure material, in this case a metal. In refining, the final material is usually chemically identical to the original, but purer. There are many different processes for refining, including pyrometallurgical and hydrometallurgical techniques. The product of the blast furnace is pig iron, which contains 4-5 percent carbon and usually some silicon. To produce a forgeable product, a further process was needed, usually called “fining” rather than “refining. ” Starting in the 16th century, this process was performed in a finery forge. At the end of the 18th century, it began to be replaced by puddling in a puddling furnace, which was, in turn, gradually superseded by the production of mild steel through the Bessemer process. 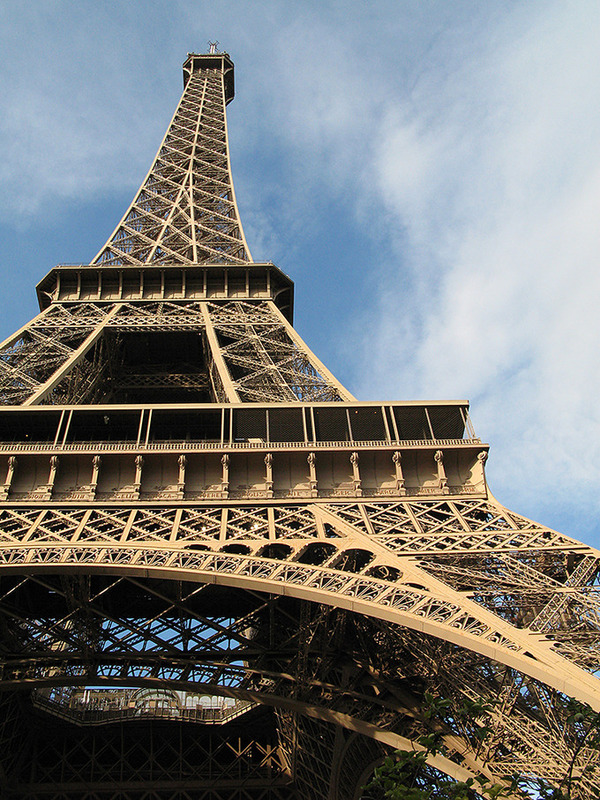 Eiffel Tower: The Eiffel tower is constructed from puddled iron, a form of wrought iron. The term “refining” is used in a narrower context. Henry Cort’s original puddling process only worked when the raw material was white cast iron, rather than the gray pig iron that was the usual raw material for finery forges. For the gray pig iron to be usable, a preliminary refining process was developed to remove the silicon. The pig iron was melted in a running-out furnace and then run out into a trough. This process oxidized the silicon to form a slag, which floated on the iron and was removed by lowering a dam at the end of the trough. The product of this process was a white metal known as finers metal or refined iron.